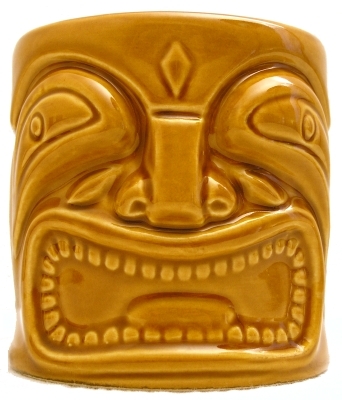 Found in the Accoutrements, Mug, and Tiki Collections. 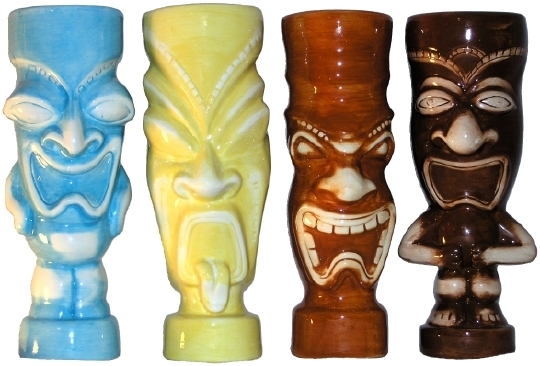 This set of four Tiki mugs is produced by Accoutrements. 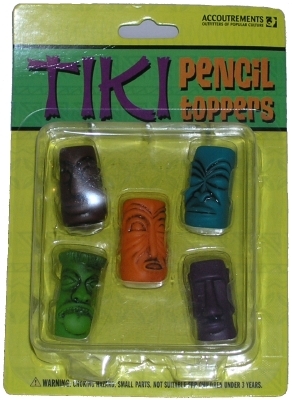 These Tiki pencil toppers are made by Accoutrements and can be purchased from the Archie McPhee store in Seattle. 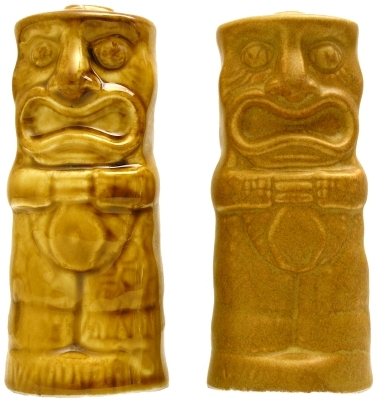 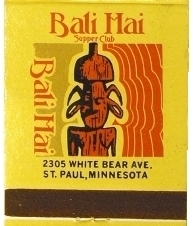 Found in the Accoutrements and Tiki Collections. 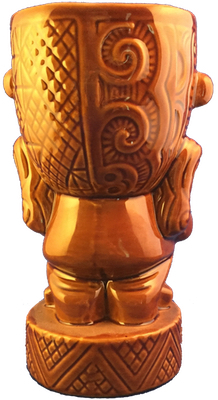 This brass object, with a design similar to the sun god on the sail of Thor Heyerdahl’s raft the Kon Tiki, may be a candle holder or a broken oil lamp. 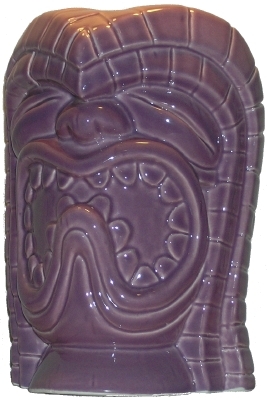 When I found it at a thrift store, it center tube was partially filled with candle wax. 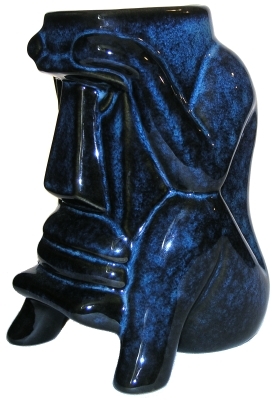 However, this object does not appear to be well-suited for a life as a candle holder. 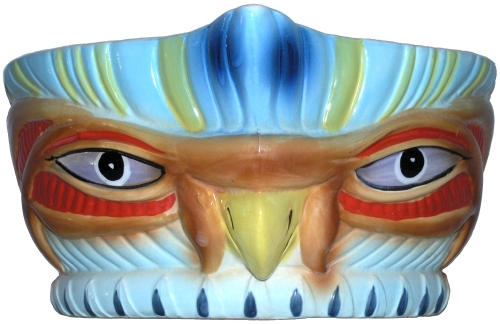 With no manufacturer marks on it, I am unable to identify it. 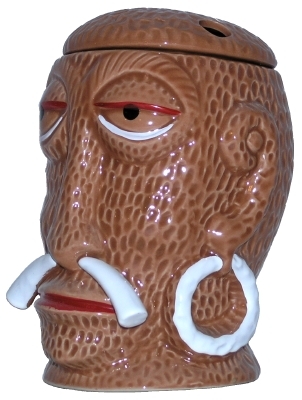 Please note the similarity between this object and the Otagiri Kon Tiki mug. 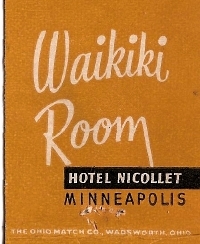 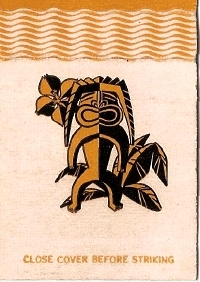 Found in the Tiki Collection. 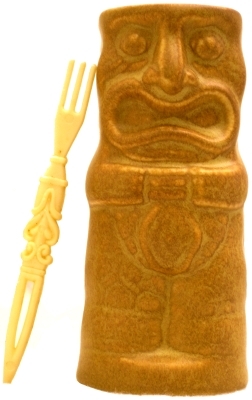 This silver souvenir spoon from Mexico feature a carved jade handle with an Aztec motif. 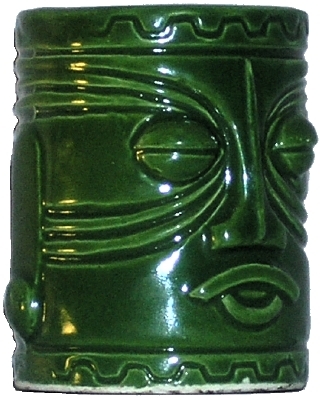 The jade carving looks vaguely Tiki to my eye, so, I have included it in my Tiki collection. 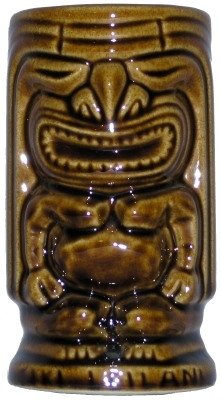 This limited edition mug was designed by Noel “Tikitronic” Henneman and produced for TIKI KON: Northwest Tiki Crawl 2006. 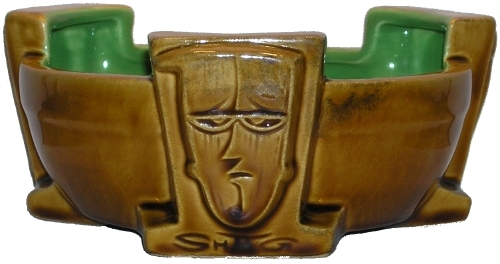 This particular mug is number 30 of 100 and is signed by the designer. 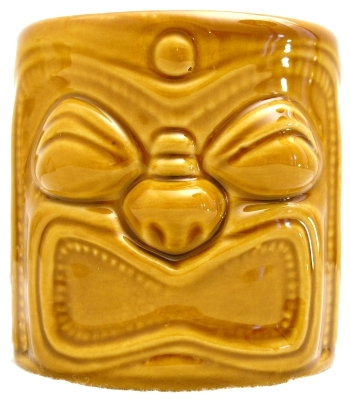 Found in the Mug, Tiki, and Tiki Conventions Collections. 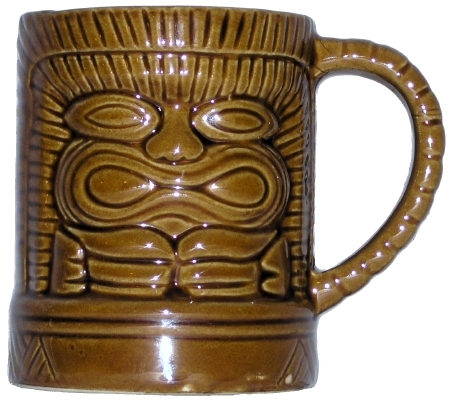 This vintage, glazed ceramic mug, produced by Otagiri, is commonly called the Kon Tiki mug due to its similarity to the sun god on Thor Heyerdahl’s raft of the same name. 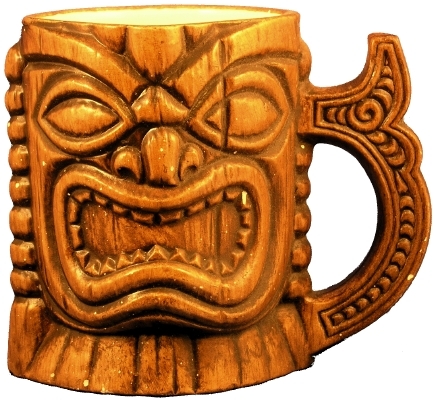 This mug can be found on page 24 of Tiki Quest - Collecting the Exotic Past by Duke Carter. 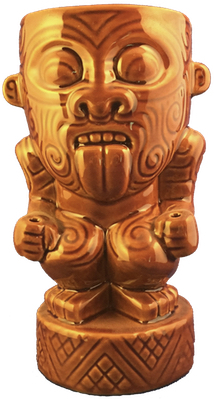 Found in the Mug, Otagiri, and Tiki Collections. 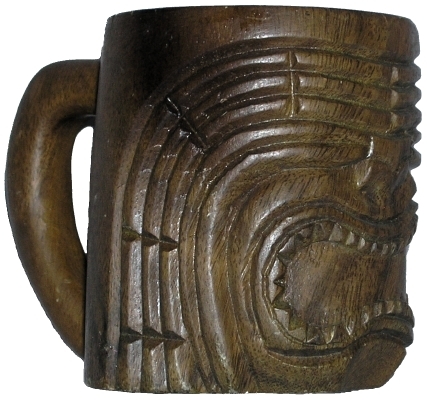 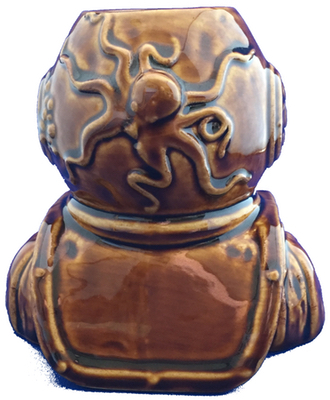 This carved monkeypod Tiki mug, depicting Ku, is 4 inches tall and holds 12 ounces. 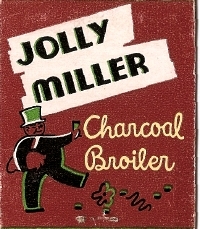 On the bottom are two stickers. 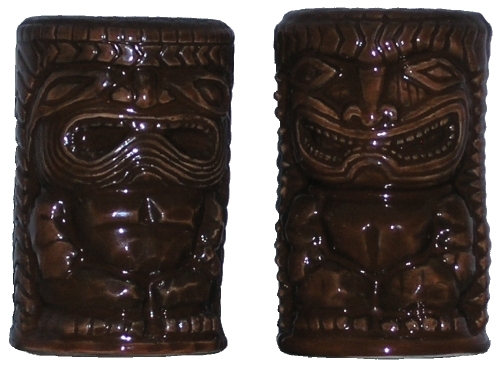 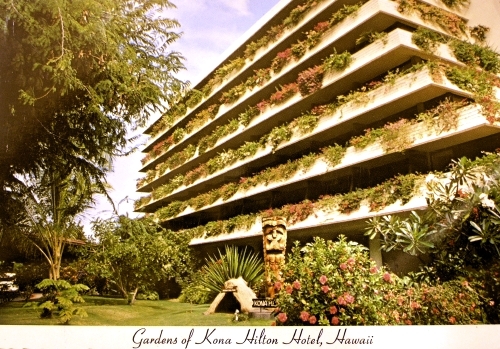 One of which says “Slii Woods Honolulu” and the other “Made in Philippines”. 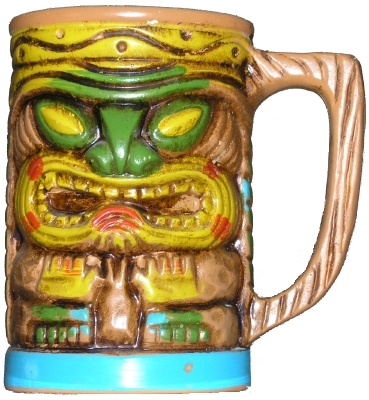 Found in the Mug and Tiki Collections. 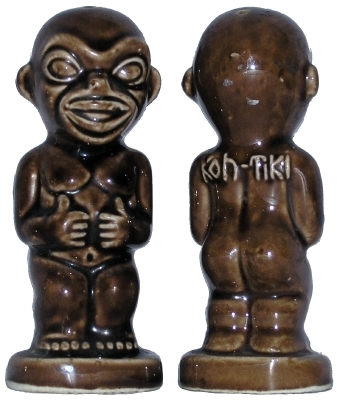 Engraved on the bottom of this small wood statue is “Tangaroa” and on the back is “Kapina of Rotorua”. 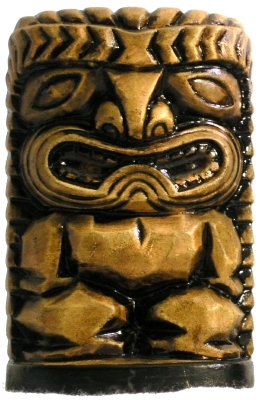 Tangaroa is a Polynesian sea-god who separated the sky from the earth. 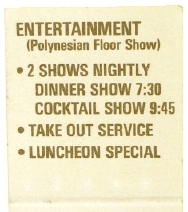 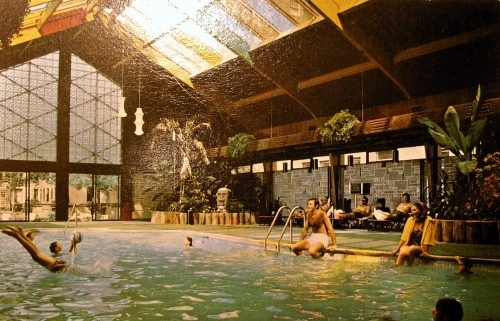 To the best of my knowledge, Rotorua is located in New Zealand. 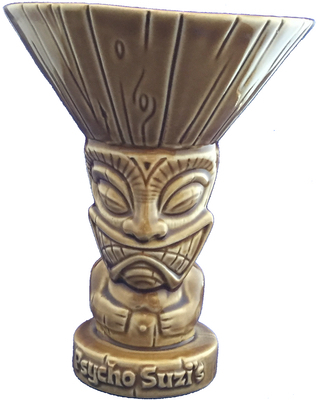 Found in the Statue and Tiki Collections. 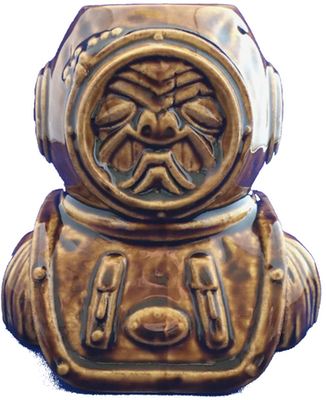 This bottle opener, made from resin, depicts Ku, Architect and Maker of War. 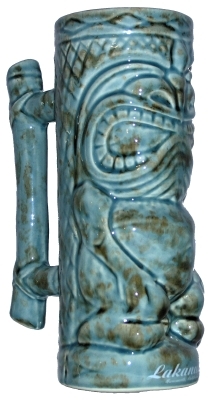 This ceramic mug, depicting Ki’i, the Creator God, was produced by Treasure Craft. 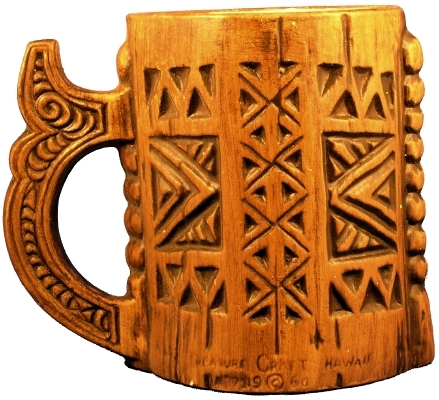 It is molded to look like it was carved from wood. 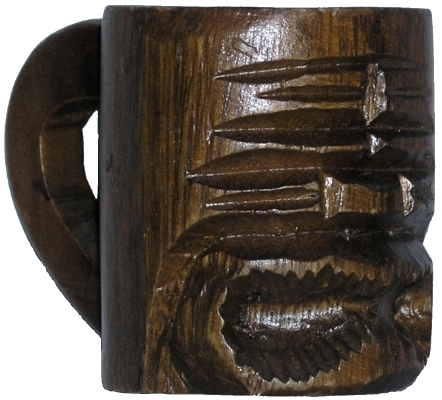 This Treasure Craft mug can be found on page 63 of Treasure Craft Pottery & Pottery Craft Stoneware by George A. Higby. 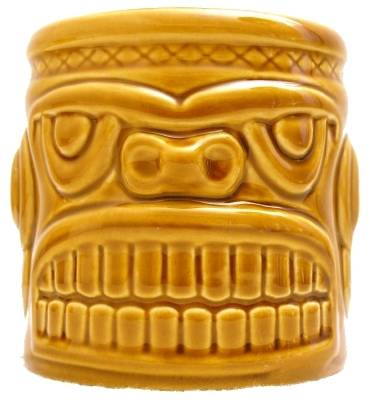 Found in the Mug, Tiki, and Treasure Craft Collections. 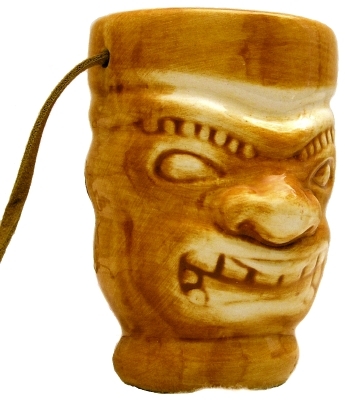 I call this wood Tiki statue the Flower Tiki because of the flower carved in its forehead. 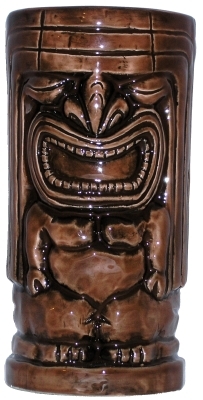 On the bottom of this carved, wood Tiki statue is engraved “Lapaula 2004″. 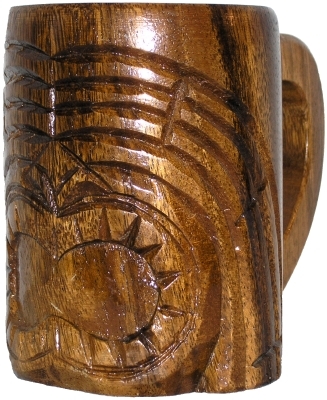 On the bottom of this carved, wood Tiki statue is engraved “Siale 2004″. 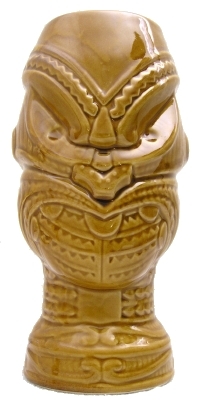 I call this carved, wood Tiki statue the Sunrise Tiki because of the sun carved into its forehead. 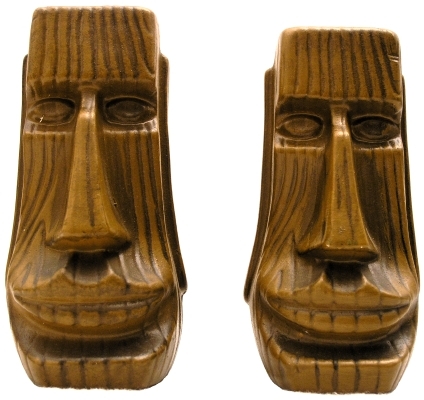 On the bottom of this carved, wood Tiki statue is “Lapaula ‘04″. 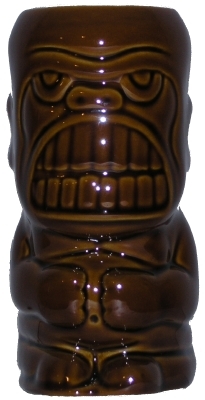 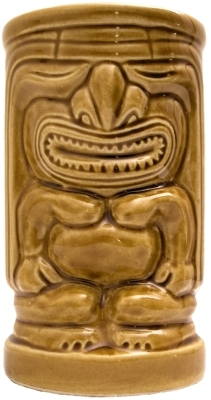 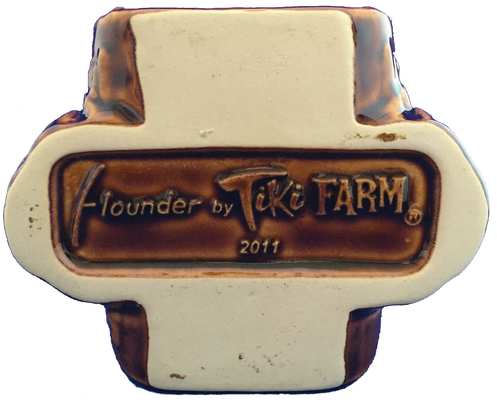 This brown, glazed, ceramic Maori-stylized Tiki mug was designed by Paul Nielsen and sold by Munktiki. 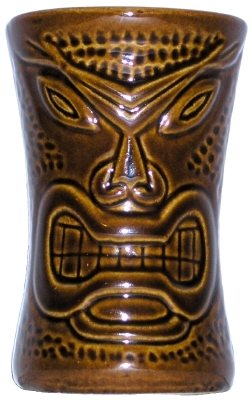 There is a hole on the top of each fist for inserting a spear. 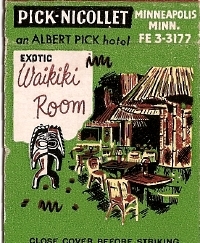 Printed on the bottom is "Muntiki Imports™ 2015". 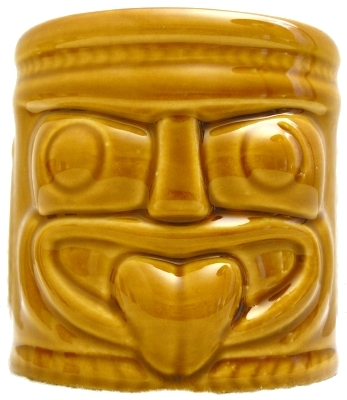 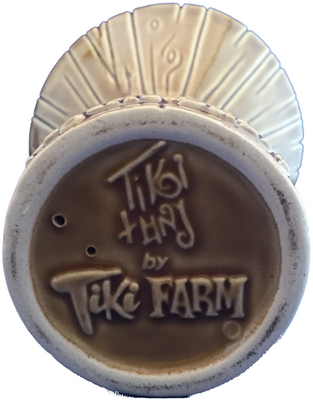 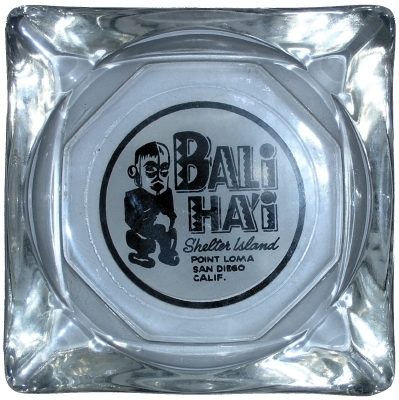 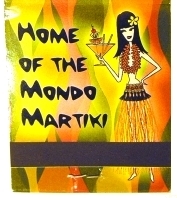 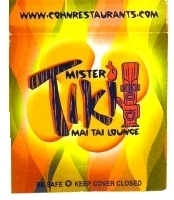 Found in the Mug, Munktiki, and Tiki Collections.